The Parish Council is consulted on all planning applications submitted in the Parish. The planning committee meets to discuss any planning applications and to agree the Parish Council response. Planning committee meetings are held in The Refectory and notice of any meetings are provided on the website and Parish notice boards. For further information on planning application please see the South Downs National Park Authority website planning information for advice, forms and regulations. We are aware of the recent press report regarding the change of use planning application for the field and are in communication with the relevant authorities. We’ll post any updates on the website as soon as we have them. If you’re not familiar with planning you may never have heard of local plans, but they have the power to make a big difference to the world around you. Next spring SDNP will submit the first ever South Downs Local Plan to the Government – setting out planning policies across the whole of the National Park, how land is used and what can be built where. But first we need to have one final full public consultation. 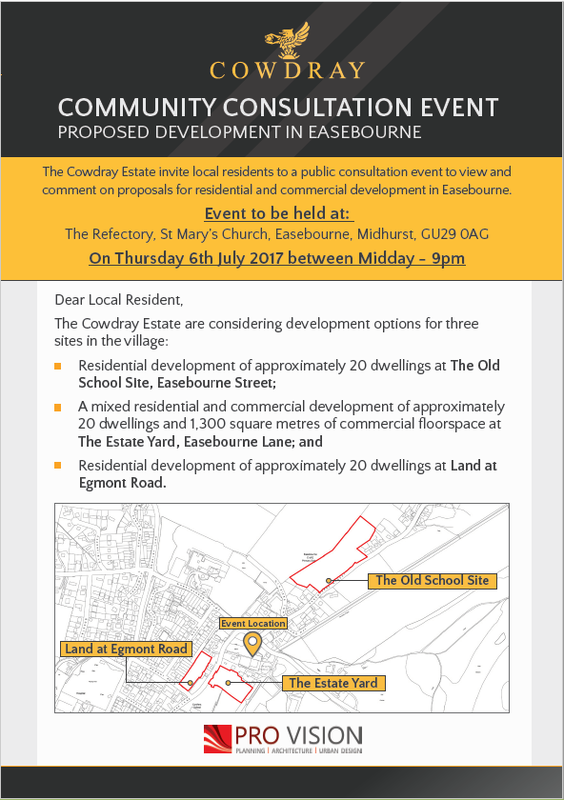 Easebourne Parish Council will be holding a planning meeting (in public as usual) to discuss the draft allocations policy for the village and the Cowdray Estate development proposals following its public consultation, details of which are below. 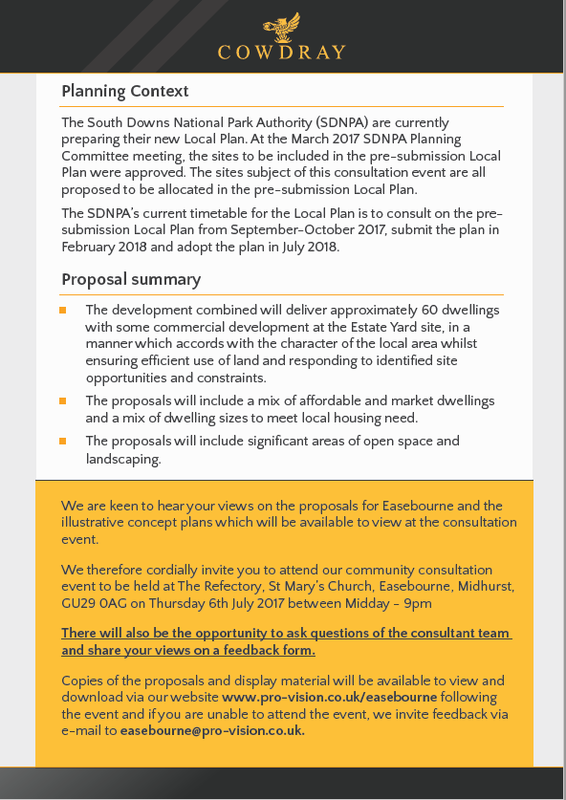 We would encourage all residents to attend the consultation as any proposals will have an impact on the whole village. Following last week’s meeting Easebourne Parish Council would like to make it clear that the leaflet issued to residents was not authorised by the Parish Council. In addition, the plans on the leaflet were not the allocations policy plans. South Downs National Park (“SDNPA”) is the statutory planning authority but it will delegate some decisions to Chichester District Council. As the statutory planning authority SDNPA has to produce a local plan for the National Park areas which it is still in the process of doing. In addition, it will have an annual housebuilding target across the National Park. The allocations policy will enable SDNPA to look at how it might achieve its target for housebuilding. It is rather a blunt housebuilding tool as the target is not ward/area specific and so housing need in areas is not always considered. The Parish Council has requested a meeting with SDNPA to discuss the allocations policy and to share our concerns and those of residents raised at the meeting. These will be reflected in the comments the Parish Council submits. The allocations plan is then due to be discussed by SDNPA at its committee meeting on 15 June. If SDNPA approves the allocations policy, the three sites identified will carry with them a presumption in favour of development but the landowner would still need to submit planning applications for the sites which would be considered in the usual way. The flipside of this is that any other sites, not identified in the allocations policy, which are brought forward in the Parish, would not necessarily be considered suitable for development due to their omission from the allocations policy.